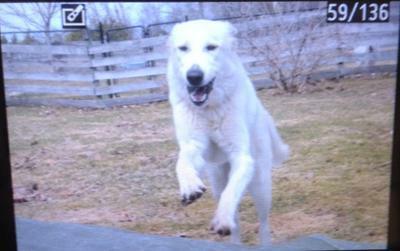 Tundra, a white fluffy (Akbash), has gone to her new family. She has 300 acres of farmed land but loves to socialize and be with her people. Way to go sweet Tundra! Tundra ended up on Kijiji. A family took her but sadly, the family was not prepared for her. She was only with them for about five days before she came to us. She was great with the autistic child and bonded with him quickly. She is about a year old, and pretty much all Akbash. Not all white dogs are Pyrs but people 'sell' them as Pyrs to an unsuspecting public. 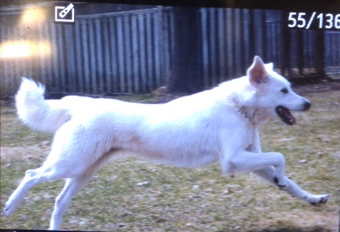 She is full of energy and needs to go to an active home or a home in a rural area where she can run in a big securely fenced area. She is not good on leash and requires much work in that area. She needs a family who is willing to take the time and patience to work with her to help her be a well-behaved girl since her manners are very limited right now. Someone never took the time to work with her as a pup. She listens pretty well and has learned sit and give-a-paw. She is very mouthy and this needs to be understood. She doesn't bite but mouths. She has been in the car quite a distance but in a large crate. She barked once and then settled in for the ride. She is good with the resident male dog. Please do your research on this breed to ensure this is the dog for you. They must be contained within a large fenced-in area of a minimum of six-foot secure fencing in which they can run, play and look after their property. Tie-outs are not suitable since this does not allow them to properly patrol their territory. They have been known to go through invisible fencing so this is also not acceptable containment. These big whites need patience and consistency in their training and someone who will work with their instincts. They are independent thinkers and, therefore, only listen if it's worth their while. Treat them as partners in a dance where you lead the way. If you think you would like to meet Tundra to find out if she would be a suitable match for your family, please contact Dr. Carol Graham at 519.853.3005 or 519.855-6439. Please leave a message and she will return your call.